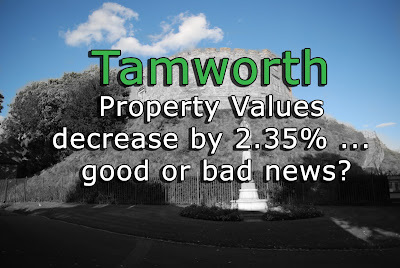 Tamworth Property Values decrease by 2.35% … good or bad news? Even the Brexit vote has not hindered Tamworth’s steady rise in property value, as Tamworth property values went down 2.35% last month alone, but still leaving Tamworth values 7.16% higher than a year ago. An increase in demand from buyers and an uninspiring level of supply (i.e. the number of properties on the market) has driven up the value of the Tamworth’s housing. …And that is where the issue is. With Brexit, the coalition of the 2010-15, a double-dip recession and post credit crunch fallout – I was perplexed that the Tamworth property market (and values) has remained so strong, still 11% higher than 20 months ago. That is until you start to look into the real reasons why we find ourselves in such a great place. The Tamworth (and the UK) housing market is built on the foundations of basic economic rules that any GCSE Economics student should understand. However, at a time when, as a country, we seem eager to uncouple ourselves from all manner of proven facts, anything is up for grabs. Even the wary RICS said throughout the UK, most of its Chartered Surveyors anticipated house prices to increase in the next six months, which seems contradictorygiven economic cautions from Mr Hammond and HM Treasury. Even though inflation will rise to around 2% to 3% in 2017 and perhaps a little more in 2018 because of Sterling’s devaluation, together with a high probability of a decelerating GDP and a slight rise in unemployment, how can the RICS and most of my landlords be so confident about the value of our homes? Well, look at from where we are starting. Nationally, a base of low unemployment, low inflation and preposterously low interest rates, while in Tamworth, the local economy is doing quite well for itself. Confidence also plays a part. Confidence can supersede basic economic facts for a short time at least, which is why actual property market changes tend to be more exaggerated, as confidence can turn both positive and negative very quickly. The fact is, there is a long-term relationship between property values, wages and unemployment. For example, looking at the graph below, you can quite clearly see the ratio of property values to earnings is nowhere near as high as it reached in 2008 and currently is in the middle of the range for the last 30 years. As a country, we are in a good place. By April 2017, Article 50 will be invoked. This will bring additional political tomfooleries and economic ups and downs. With both purchasers and vendors predisposed by the 24-hour news cycle, which let’s face it, gets more haphazard by the day, it is likely to prove a challenging couple of years … and yes, Tamworth property values might drop slightly in 2017, but based on what we know of the UK Plc now, the UK and Tamworth property values are not projected to move that much over 2017 or 2018. Going into the next two years, we are in much better financial shape as a country compared to the last two crashes of 1987 and 2008. But, on the other side of the coin, what we also know is that we don’t know much about the form of our economic future or indeed many other facets of our lives. Confidence will continue to be the key player in the Tamworth housing market for a while longer – yet this may spur some much needed second-hand market activity? Now, where is my crystal ball? Previous PostPrevious Tamworth Housing Crisis? Only 1.5% Of Tamworth Homes Are For Sale.